For years, Jersey breeders have touted their high fertility rates, calving ease, and greater milk solids than Holsteins as a viable alternative to Holstein breeders looking to increase their profits. A recent Holstein International article, Feed Conversion: Building a More Efficient Engine, adds another item to the list, feed conversion. A recent research paper in the Journal for Dairy Science compared the input requirements of two different production systems, Holsteins and Jerseys to produce a given amount of cheese. In their research of over 13,000 herds spread across 45 states, Dr. Jude Capper and Dr. Roger Caddy found that it would take 109 Jerseys to produce the same amount of cheese as 100 Holsteins. What they also found was that they would have just 74% of the body mass and produce 81% of the milk volume, 80% of the Green House Gases and would only require 68% of the water and 89% of the land requirements. So in essence Jerseys would be more efficient at producing the same amount of cheese. 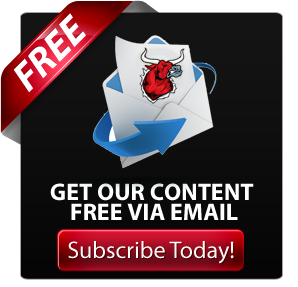 In their article, Holstein International also points out another Dairy Science paper published last year that looked at feed intake studies for 4 breed groups: Holstein, Holstein x Jersey, Jersey x Holstein and Jersey where all cows were fed the same ration, were housed in the same type of pens and were milked together. The results found that Holstein had the highest intake and the highest production yield. 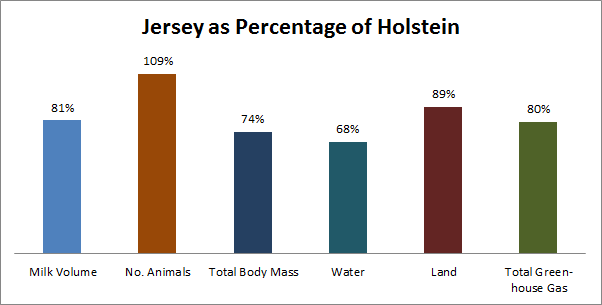 However, Jersey converted a higher percentage of their intake to production than Holstein did. As the dairy industry moves away from focusing solely on overall production and starts to focus more on the overall profitability of their farming operations, key metrics like feed conversion are sure to gain increased importance in breeding programs. 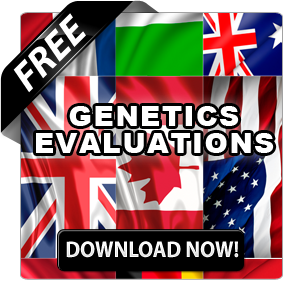 Similar to how Scandinavian countries lead the way with Health traits, countries like New Zealand are leading the way by using body weight as an indicator of feed intake and making it apart of the Breeding Worth (BW) index. Countries such as Australia have also started to incorporate weight into their national indexes by using type classification data as a predictor of body weight. While body weight in time may not be the best measure of efficiency, it is what is currently available. One of the interesting findings was that even under the New Zealand system the cows are getting larger, though at a slower than expected rate. It is clear that the dairy industry is moving towards producing a more profitable cow. With low heritable health traits already gaining a great deal of focus, it only makes sense that the next step will include efficiency. For many Holstein breeders this may be a wake up call that they need. In the same way that other industries first focused on overall production and then had to put more focus on efficiency, dairy producers now have to do the same. For many breeders this may mean either cross-breeding with the more efficient Jersey bloodlines or putting greater focus on efficiency in their breeding programs. Never forget for one moment that feed costs represent 55% of the inputs on a dairy operation. Efficiencies gained here can be significant. It’s no longer about who can produce the most, it is about who can produce the most with the least cost. 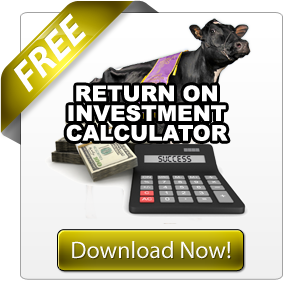 Want to make sure you are investing your money wisely? 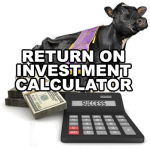 Download our Dairy Cow Investment Calculator. 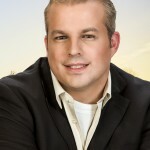 Mapel Wood Farms - Invest in the Best! Forget the Rest! 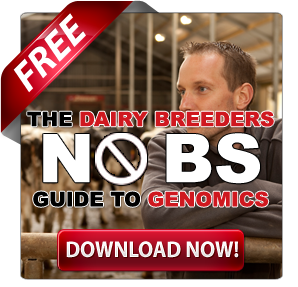 Dairy Breeders vs. Genetic Corporations: Who are the True Master Breeders? I am not talking about #’s of cattle. Profitability. There is a big difference. And there are some key things that breeders of any breed can learn from looking at feed conversion. I agree Ron, I have never seen any studies regarding feed conversion of Swiss, I presume they are always assumed to be the same as Holstein, which is inaccurate in my experience. Profitability is also dependent greatly on other factors like health and fitness and longevity. I used to have a pure Holstein herd until I started using some other breeds over my Holsteins, Jersey being a large part. After a few years, it’s really no contest for me. The Jersey crosses have completely outperformed the pure Holsteins. It’s also opened up my mind to other breeds like the Nordic Reds and Montbeliarde. Those crosses have also outperformed Holsteins on my farm. Therefore, the pure Holstein is losing its hold in my herd and will eventually be an endangered species in my little corner of the world. Thanks for your comments. The question I ask, is how do you market your top genetics, when there is no demand for cross bred cattle. That is why I wonder if the purebred industry would rather change weighting or focus as opposed to endorse cross breeding. But like how public demand will drive the adoption of polled cattle, maybe profitability drive adoption of feed conversion. As for marketing top crossbred genetics, at this point you really don’t. Like you said, the market isn’t there. Personally, it’s a matter of marketing my pure Holsteins in the cull market to make room for the more efficient crossbreds. I do believe there is a very small niche market emerging for crossbred genetics but it’s absolutely minuscule compared to purebred genetics. For purebreeders that market genetics, it’d be insane to start crossbreeding. So I think you’re right that looking at things like feed conversion and profitability will help move those areas forward in the pure breeds. Feed efficiency can probably be moved forward in a breed like the Holstein but I have my doubts about reproductive efficiency. The downward trend has been stopped but I think it will plateau as we start to see lines with good repro efficiency being inbred. But that’s a different discussion in itself. Jon you sound like a very honest guy. For those like Jon that want to increase longevity and fertility,don’t look in the show ring or at the top of the price list. Just look for the highest Prod Life and DPR bulls.They are usually +6 on PL and +2.00 on DPR or more. This is the recipe for success in commercial herds. Don’t worry about their linear charts….that is a 1 min. look at 2yr.olds..little to do with fertility or longevity.. . If you hope to breed $1 million dollar show cows….they are in the show ring and have good longevity, but most….not all… get extremely good care as well..
I’d need a Holstein bull to be +6.0 on DPR to match the fertility advantage of other breeds mixed with the hybrid vigor effect. Obviously cow numbers change each year. What is the % by breed today… in Italy and what is your source? 900,000 Brown Swiss found dead in Italy. Man that could be a great post for the site. Better than 4 million Holsteins found dead in the US…depending upon what year your numbers came from! There used to be 13 milion total US dairy cows, now less than 9 million. There have always been more dairy cows in either Wis,.or Calif. than Canada. But it’s not additive, is it? 3 + 3 won’t yield 6. But yeah, when looking at marketing top fertility bloodlines, two +3.0 DPR bulls in a row will likely give you elite DPR numbers for a Holstein (so long as the genes line up). Problem I see is that how many generations can you do that until you start inbreeding and inbreeding depression kicks in? Before I went all in with crossbreeding, I exhausted Manfred, Outside, and Rudolph bloodlines (through sons and grandsons) where in order to continue I’d be recycling. Wizard would be one I didn’t, but his descendants almost always come crossed with the aforementioned bloodlines. Linebreeding for DPR isn’t something that could really work. But you didn’t mention ZADE or Jevon two of the best progeny proven bulls and now many Genomic young sires as well..No need to inbreed for this trait. Two very good health trait bulls, yes. I forgot to mention we had also gone crazy with Duster sons, and Wade himself also was used in my herd. We’ve been breeding for health traits pretty much since the information was available. this is a really good point, my swiss who have bull calves have been $100 ahead of the jerseys straight up, just on bobby calf price. and every cow eventually has to have a cull price. having milked up to 300 jersey’s they just don’t stack up in manageability, temperament, health and longevity. but i don’t know what the formula is for a $ price on these things. yes, maybe they make more kg for feed input, which is easy enough to calculate, but it’s the things that aren’t easily calculated that make the big difference. I think the Holstein will continue to be the most popular mainly for the volume of milk they can produce. I do think we have put to much emphasis on increasing the size of the Holstein for show purposes especially. This has developed a two class system. We need to bring the two classes together to have a smaller more effecient cow with that great overall type we love to show. One true type model with high quality and quantity of milk and that great style for longevity and overall effeciancy. In my opinion this is the path the Holstein breed needs to pursue to contunue to stay on top. Some one commented about the cull value and the low price for bull calves. I used to feel the same way until someone pointed out to me that it also costs 1/3 less to raise the cow to begin with and also with the longer life and shorter calving interval we should have a few more calves to sell or a few cows to sell for dairy instead of cull. It still drives me nuts to only get $50 for a bull calf though when Holstein calves are over $100.